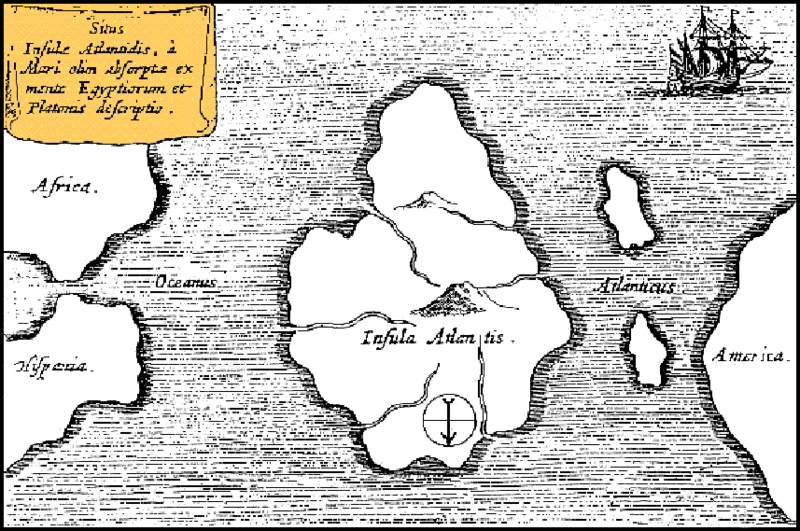 Athanasius Kircher’s map of Atlantis, in the middle of the Atlantic Ocean. From Mundus Subterraneus 1669. A couple of posts ago, when discussing Plato’s notion of contentment, I brought up the Lost Continent of Atlantis. Actually Plato brought it up, first in his Timaeus and later in the unfinished Critias – both written in 360 BCE. Of course Plato never speaks for himself. He puts everything into the mouth of his characters. The character of Critias claims the fall of Atlantis happened over 9000 years before his time. That he, Critias, heard the story as it was passed down from a story told to Solon 300 years ago, who heard it from Egyptian priests. Now there’s a game of gossip for you. 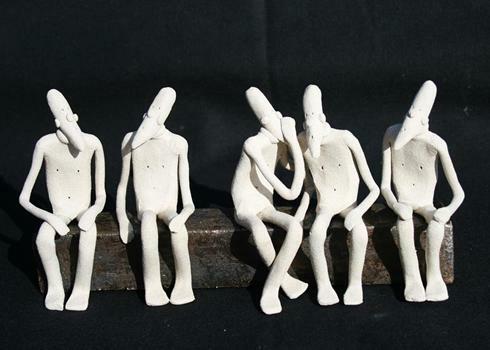 Sculpture by Sally Dunham, whose website you should visit. Many believe that the myth of Atlantis is intended as an allegory, like Plato’s famous Cave. Atlantis – the naval power that could not be beaten until it was – represented the overreaching lust for power and conquest; Ancient Athens – the only city-state able to defeat Atlantis – the ideal of Plato’s Republic. After Athens liberates the territories Atlantis enslaved, a cataclysmic earthquake/tsunami occurs, and the island sinks to the bottom of the sea, a victim of its own hubris. But there are so many vivid details in Plato’s account – in particular in the Critias – the flora, the elephants, the canals and concentric circles– that it has been tempting to think there might be a basis for the story in historical fact. After all, there are other stories the philosopher uses symbolically that mix historical and fantastic components. Why not this one? 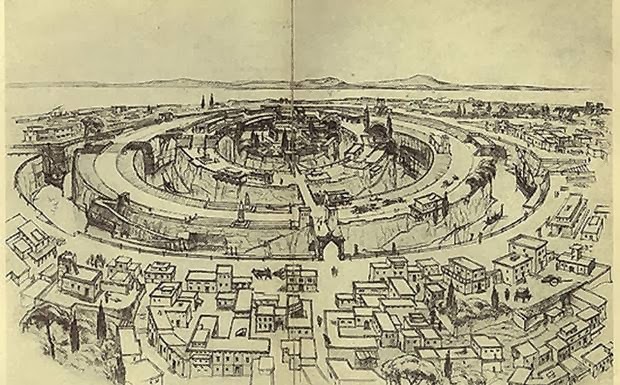 Reconstruction of the capital of Atlantis according to Plato’s description, drawn by Walter Heiland, 1934. Courtesy Old World Mysteries. What I find most interesting about the history of Atlantis as a story is who changes its details, and why. The first thing to go in Plato’s account, for example, is that everyone died. That theory came from New Spain, as Mexico was called by its conquerors, about 150 years after Columbus’ voyage. From a failed Jesuit, Don Carlos de Sigüenza y Góngora. Sigüenza was Criollo; he had been born of Spanish parents, but he had not been born in Spain. In the rigid caste system of the time, he was considered inferior to the Peninsulares, those born on the Iberian peninsula, though of higher caste than indigineous or mixed-race peoples. He had a vested interest in proving his birthplace was as good a place to be born as any. Carlos de Siguenza. 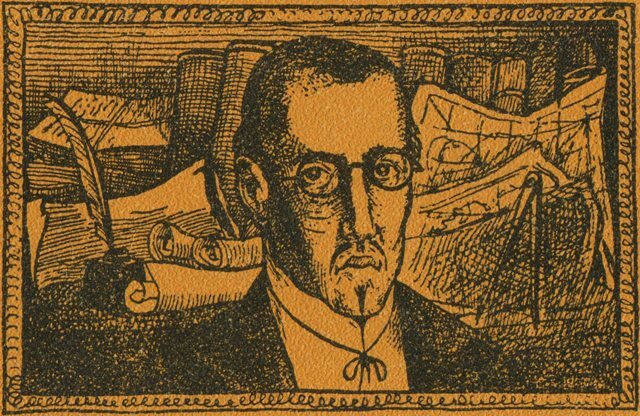 Illustration by Julio Prieto for an edition of his writings published in 1972. Courtesy (oddly enough), a blog on the history of bullfighting in Mexico. The Jesuits kicked Sigüenza out for being too undisciplined, but they couldn’t undo his education. One of his influences was Athanasius Kircher, who believed ancient Egypt was the cradle of civilization. Here was the framework Sigüenza needed to assert that the New World had just as good a pedigree as the Old. Not only was Sigüenza a scholar; he was also a mapmaker, and the Royal Geographer for the colony. He had a great interest in indigenous peoples and their manuscripts. Shortly after being dismissed from the Jesuits, he began to study Nahuatl, the language of the Aztecs. From his study of these manuscripts, as well as from the archeological evidence of the pyramids, he formed the theory that the Mexican Indians were the descendants of the Naphtuhim, the son of Misraim, founder and ruler of Egypt. He further believed that the name Naphtuhim was a variation on the name Neptune, the ruler of Atlantis. Atlantis, then, was populated by Egyptian colonists, and some of them had clearly ended up here. He was also the first to try to align Plato’s story with the Bible, suggesting that Atlantis was actually destroyed in Noah’s flood. Failure and an interest in Atlantis seem to have a rather strong correlation. May I introduce you to Minnesota’s own Ignatius L. Donnelly, failed politician. Trained as a lawyer, Donnelly moved to the Minnesota Territory from Pennsylvania in 1857; like our cynical friend Diogenes, there may have been some financial scandal preceding his departure. In Dakota County, he started a utopian community, Nininger City, founded on cooperative farming. Then came the Panic of 1857. Donnelly, deeply in debt, went into politics. He was populist in his leanings. As we all know, that seldom means you can work the machine. Was he really, Honest Long Cut Tobacco? Next time stick to baseball cards. 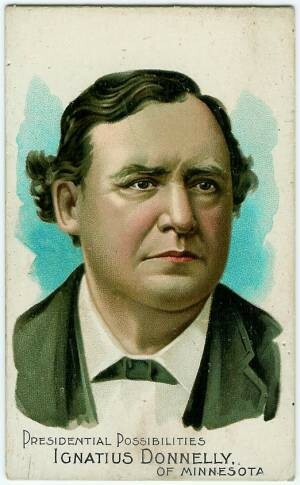 It was during the period of time when he gave up politics – from 1878 to 1887- that Ignatius L. Donnelly became famous. He had returned to his law practice, but that was slow. In his spare time, he turned to armchair scholarship. It was the nineteenth century. Everyone was an amateur botanist / entymologist / archaeologist. Is it any surprise that Donnelly, failed politician from a failed utopia, chose to solve the mystery of Atlantis? He took for his inspiration Heinrich Schliemann, who believed that a careful reading of the Illiad would lead him to the historical Troy. And it did – though doing an archaeological dig with dynamite probably destroyed as much as it uncovered. Donnelly did not have the means Schliemann, who had retired at 36 after cornering the market on the raw materials used to make munitions in the Crimean war to pursue his Homeric dream, did. But he had a good library, and a lot of time on his hands. So he read – and read into – Plato, and the works of Mesoamerican scholars like Charles Etienne Brasseur de Bourbourg and Augustus Le Plongeon – and came up with his own theories. 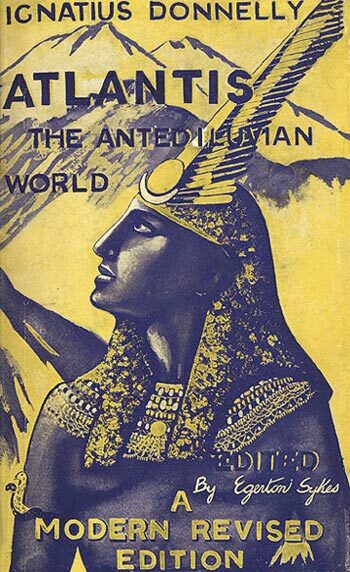 The result, published in 1882 was Atlantis: The Antediluvian World. The book was immensely popular. Even William Gladstone, Prime Minister of England, sent Donnelly fan mail. Yes, you can read the book online. Free. Because science. What Donnelly jettisoned from Plato’s account was the whole idea of punishment. Like Sigüenza, Donnelly believed that Atlantis was actually destroyed by the same Great Flood that is described in the Bible. But Donnelly, who had grown beyond his Irish Catholic roots to embrace the real and the rational, insisted in his sequel to the book that a near collision with a comet caused the flood, not the wrath of any God or gods. In fact there was a comet in 1882, the year Donnelly published The Antediluvian World. The 19th century was a great era for comets. They got tossed backwards over the shoulder as an explanation for all sorts of historical phenomena, especially those that had previously had a religious explanation. Or at least a traditional religious one. Enter the Cosmic Beings. And a Russian spiritualist. 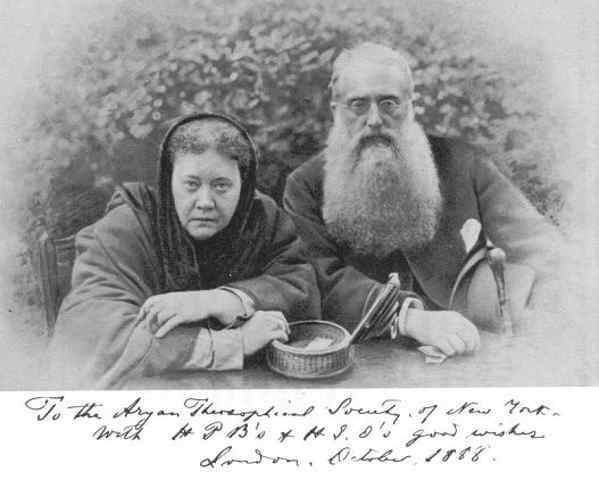 Helena Petrovna Blavatsky was a itinerant traveler and impoverished aristocrat who claimed to have visited Tibet – next to impossible for anyone at the time, let alone a woman – and studied with the Masters of the Ancient Wisdom. She may well have, though we have no independent verification of her claims. Her book, The Secret Doctrine, was supposedly dictated in Atlantis itself. We have no independent verification of that claim either. It begins where Donnelly leaves off. According to Blavatsky, the civilization of Atlantis reached its peak maybe a million years ago, but was destroyed by internal warfare among the inhabitants, who had developed dangerous psychic and supernatural powers. The only thing Blavatsky disliked in Donnelly was his belief in Darwin’s theory of evolution. The form of spiritual evolution she proposed instead depended on “Root Races,” the first three created from pure spirit. During the fourth period, higher beings descended to the planet, human physical bodies developed, and the sexes separated. The fourth Root Race were the Atlanteans, but they became decadent and corrupt. The fifth race was the Aryan Race, the Root Race of those living now. Two more races are to evolve in the future, as we move toward universal brotherhood. Why has Plato’s Atlantis captured so many imaginations? Precisely because it is a myth we want to change. In truth, we don’t like Plato’s story. In the depths of our hearts, at the base of our spines, and along all those chakra lines, we don’t want to believe anything can be lost forever. And we certainly don’t want to believe in forever punishment. We want to believe in ourselves. In the ability to amend our lives. And so we amend the story. The ways we change its meaning reflect the ways we have or have not come to terms with what has not gone the way we wanted in life. And so we ask Atlantis to rise again. And we make it in our own image. Enter Paula Reed Nancarrow, failed adult. Who overextended herself and sunk to the depths of the sea. Naval conquest was not my undoing, nor fearsome Jesuits. It was not caste prejudice or populist politics. I am perfectly content to have evolved from an ape, and more than happy to believe all races equally human, and equally divine. I do not have to be the reincarnation of a member of a lost civilization descended from aliens to reclaim my psychic powers. 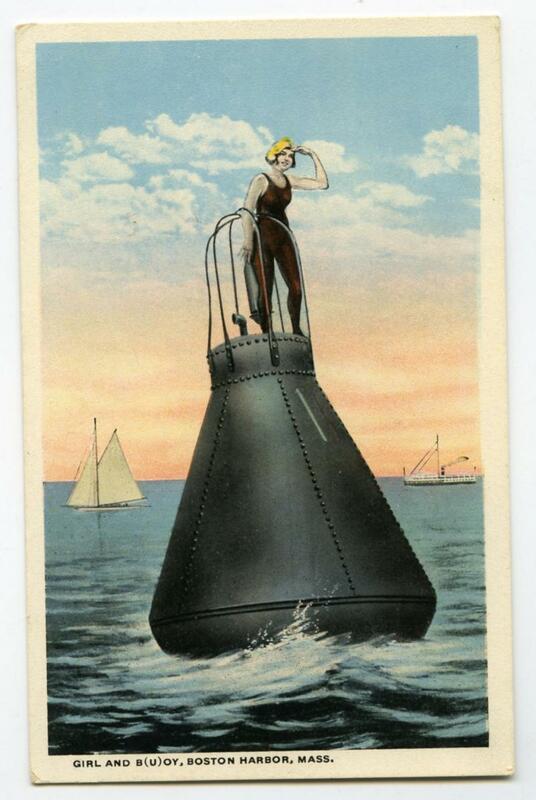 My failures have not been nearly as dramatic as those who hang their whole existential significance on a buoy over the lost continent. They are ordinary failures, both personal and professional: a broken marriage, an underwater mortgage, a poorly timed business venture. There are smaller, ongoing failures as well: dwelling on things I don’t like about people, instead of the things I do; not having the courage of my convictions; being too tired to call my parents after a long work day. It has been four years since the foreclosure of my home. Four years since I finally landed a part time job in the recession. Three years since I landed the second one. A year and a half since one of those jobs became full time. I have rented rooms in other people’s houses – friends, but other people’s house all the same. I saved money. I rebuilt credit. I bought a new old car. You can recover from failure. You can. Next month, I will move into an apartment of my own. No man, or woman, is an island. But for the first time in a very long time, I will once more rule mine. And if I can’t keep it afloat, at least I know how to swim. Thank you, Paula. I feel we have had similar legs to our individual journeys and I am glad to know someone else is on the path – working hard to mend the part of the world she is part of. You’ve written fine study of lost things and the search for mysterious pasts. You always add details that I never knew or put things together in ways I’ve never thought to – so I appreciate the way you tell the tale as much as the tale itself. You always surprise me – and that’s why I keep turning the pages of my own life – because, sometimes it can work out better than you can even imagine at the moment. P.S. I don’t think you’re a failed adult. We do indeed have similar legs, my Annie, and I thank you for your reflections, both here and via email. I also appreciate the not failed part. I am not entirely in the realm of self-pity there, though I fear it may have appeared so; my thoughts were in fact turned to Bill Holm, who made music of all our failures, and thus raised them up. As may we all. Fascinating post, Paula. Interest in how our own needs affect not just the tone but the content of the stories we tell. Great news about the recovery of your own Atlantis and look forward to the virtual housewarming party! Thank you, Anne. I was guessing you meant tone and not torn, so I used my superblogger powers to correct that – although the torn of my stories has symbolic resonance too. My official move-in date is May 1, and we will roll out the virtual party apace. That is quite a collection of links there. Thank you for offering it up. I’ve always been interested in Atlantis and myths. Not sure what that says about my individual journey, but I’m certainly enjoying yours. Good luck with your new apartment. Congratulations. And I hope your myth has a happy last chapter. Thanks, Judy. You’re obviously not the only one interested in Atlantis – there are a ton of “documentaries” out there, for which I’m providing a few links here. The ones from National Geographic and the History Channel had particularly melodramatic musical scores. The Discovery Channel has another in that camp. The best one I found (though it has some pretty cheesy reinactments) was one that Ted Danson narrated that was originally on A&E. That was where I actually was clued in to Siguenza; none of the other resources I looked at brought him up. I even ended up watching the most famous of the B-grade Hollywood movies: Atlantis: The Lost Continent. It begins with a recap of Ignatius Donnelly’s theories. What I find most interesting about it, however, is how it reflects the Cold War fears of nuclear war. My friend, M. L. Rigdon, is an Atlantis fan and wrote 2 YA fiction books based on it. She based a lot of how she sees Atlantis on the work of Edgar Cayce. I watched a TV show early this year that claimed their team found Atlantis located outside the Pillars of Hercules, and that it sank because the people had turned greedy and been tainted with evil. I think it’s interesting, in the same way I find Jack the Ripper and all the theories that surround him intriguing. Fascinating post – I love how you brought your point home to a deeply personal conclusion. Best of luck in your new place – I hope the only swimming you’ll have to do is in a warm pool. I was fascinated with Atlantis as a youth. I was/am fascinated with the theory that Santorini , a greek volcanic island that blew its top, was the foundation for atlantis. but that is another story. Yes, one of the documentaries I watched – the A&E one I mentioned in my comment to Judy – goes into the Santorini theory some. I’m glad to know there’s a line out there for me. Thanks, Leif. You’re on an archaeological dig, Paula. One of Ithaca’s claims to fame is that Madame Blavatsky spent time here around 1875 (thank you, google) where she wrote Isis Unveiled. In the 1960s, a few friends pointed out the house where she had stayed. I spent my formative years in a philosophic bookstore with a widely read teacher which meant I read Plato and a few more esoteric people around me talked about Atlantis. Blavatsky’s books were on the shelf. I never knew what to think about Atlantis or the Madame (other than noting her piercing blue eyes). I love ancient mythology, but Atlantis didn’t grab my imagination. You made a nice turn at the end to talk about Atlantis and failure, personal and collective. In Ithaca, our failures are blamed on karma or difficult astrological aspects or a problematic natal chart. Maybe too much gluten. Oh, Elaine. I am so sorry it took me so long to respond. There was the move on the 24th, and work-related things after that, and then my father’s health took a nosedive. So I’ve not been on the blog for more than a month. I know a lot has been going on with you, and that your brother passed away. Your blog is one of the places I’ve been telling myself I would visit when things settled down. I know I will meet him there, as I have during his illness, just as I will encounter you. How grateful I am are that words can create a bridge between human beings, however imperfect and fragile. I had such a fascination with Atlantis and Lemuria as a high school student. A wonderful English lit teacher encouraged me to pursue my interest as a topic for a term paper. Perhaps she sensed that I lived too close to the edge of disaster at that point in my life. I didn’t. My interest in the legend of Atlantis was part of a search for hidden truths and the hope humans might once have been a whole lot smarter than they seemed to be to me at 15. Maybe it was a good thing I abandoned my preoccupation with that lost continent! Thanks for this interesting and thought-provoking piece! Thank you Anna. And my apologies for the tardy response. As I explained to Elaine, life simply got away from me.